Stem cells are the body’s natural reservoir – replenishing stocks of specialized cells that have been used up or damaged. We all have stem cells at work inside us. Right now, inside your bone marrow, stem cells are busy making the 100,000 million new blood cells you need every single day! We need to make new cells all the time, just to keep our body functioning. Some specialized cells, such as blood and muscle cells, are unable to make copies of themselves through cell division. Instead they are replenished from populations of stem cells. Stem cells have the unique ability to produce both copies of themselves (self-renewal) and other more specialized cell types (differentiation) every time they divide. Stem cells, therefore, are essential to the maintenance of tissues such as blood, skin, and gut that undergo continuous turnover (cell replacement), and muscle, which can be built up according to the body's needs and is often damaged during physical exertion. Stem cells are unspecialized. Unlike a red blood cell, which carries oxygen through the blood stream, or a muscle cell that works with other cells to produce movement, a stem cell does not have any specialized physiological properties. Stem cells can divide and produce identical copies of themselves over and over again. This process is called self-renewal and continues throughout the life of the organism. Self-renewal is the defining property of stem cells. Specialized cells such as blood and muscle do not normally replicate themselves, which means that when they are seriously damaged by disease or injury, they cannot replace themselves. 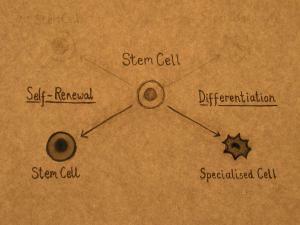 Stem cells can also divide and produce more specialized cell types. This process is called differentiation. Stem cells from different tissues, and from different stages of development, vary in the number and types of cells that they can produce. According to the classical view, as an organism develops, the potential of a stem cell to produce any cell type in the body is gradually restricted. Stem cells may help us understand how a complex organism develops from a fertilised egg. In the laboratory, scientists can follow stem cells as they divide and become increasingly specialized, making skin, bone, brain, and other cell types. Identifying the signals and mechanisms that determine whether a stem cell chooses to carry on replicating itself or differentiate into a specialized cell type, and into which cell type, will help us understand what controls normal development. Some of the most serious medical conditions, such as cancer and birth defects, are due to abnormal cell division and differentiation. A better understanding of the genetic and molecular controls of these processes may yield information about how such diseases arise and suggest new strategies for therapy. This is an important goal of stem cell research. This property is already used in the treatment of extensive burns, and to restore the blood system in patients with leukaemia and other blood disorders. Stem cells may also hold the key to replacing cells lost in many other devastating diseases for which there are currently no sustainable cures. Today, donated tissues and organs are often used to replace damaged tissue, but the need for transplantable tissues and organs far outweighs the available supply. Stem cells, if they can be directed to differentiate into specific cell types, offer the possibility of a renewable source of replacement cells and tissues to treat diseases including Parkinson's, stroke, heart disease and diabetes. This prospect is an exciting one, but significant technical hurdles remain that will only be overcome through years of intensive research. In many cases it is difficult to obtain the cells that are damaged in a disease, and to study them in detail. Stem cells, either carrying the disease gene or engineered to contain disease genes, offer a viable alternative. Scientists could use stem cells to model disease processes in the laboratory, and better understand what goes wrong. New medications could be tested for safety on specialized cells generated in large numbers from stem cell lines – reducing the need for animal testing. Other kinds of cell lines are already used in this way. Cancer cell lines, for example, are used to screen potential anti-tumour drugs. How do all these stem cell types compare? 3. Tissue stem cells: found in our bodies all our lives. You can read in detail about the properties of these different types of stem cells and current research work in our other fact sheets. Here, we give you a short overview of different stem cell types before comparing the progress made towards therapies for patients, and the challenges or limitations that still need to be addressed. Embryonic stem cells (ESCs) have unlimited potential to produce specialised cells of the body, which suggests enormous possibilities for disease research and for providing new therapies. ESCs are what is called pluripotent, that means they can differentiate into any cell type of the body. Human ESCs were first grown in the lab in 1998. The cells are derived from a developmental stage, when about 200-300 cells form a so called blastocyst – a very early embryo. But not every experiment requires a new blastocyst. As of October 2016, about 300 different cell lines, each derived from a single embryo, were obtained in Europe (source human pluripotent stem cell registry). These cell lines need to be very well characterised for scientists to use them in clinical trials or drug development – another reason which limits the number of embryonic stem cell lines. Current challenges facing ESC research include ethical considerations and the need to ensure that ESCs fully differentiate into the required specialised cells before transplantation into patients. A revolutionary breakthrough in stem cell research was the Nobel Prize-awarded discovery that specialised adult cells can be ‘reprogrammed’ into cells that behave like embryonic stem cells. The discovery of these induced pluripotent stem cells (iPSCs) also raised hopes that cells could be made from a patient’s own skin (or other tissues) in order to treat their disease, avoiding the risk of immune rejection. It also allows the generation of iPSC cell banks, which would work almost like blood banks, where a matching donor can be found for patients. However, use of iPSCs in cell therapy is theoretical at the moment. The technology is very new and the reprogramming process is not yet well understood. Scientists need to find ways to produce iPSCs safely and more efficiently. The cells must also be shown to completely and consistently differentiate into the required types of specialised cells to meet standards suitable for use in patients. Many tissues in the human body are maintained and repaired throughout life by stem cells. These tissue stem cells are very different from embryonic stem cells. Tissue stem cells, are not pluripotent like ESCS, but multipotent. That means they can only make a limited number of specialised cell types that are specific for their organ of origin; neural stem cells, for example, can only differentiate into specialised brain cells, whereas blood stem cells can only form specialised cells of the blood system. Stem cells are important tools for disease research and offer great potential for use in the clinic. Some adult stem cell sources are currently used for therapy, although they have limitations. The first clinical trials using cells made from embryonic stem cells have just finished, but further studies are needed before any therapeutics for more patients can be approved. This also shows in the clinical trials involving either ESCs or iPSCs: while ESCs are used in several clinical trials to treat diseases, iPSCs were so far only used in one single study to treat Age-related Macular Degeneration (AMD), which is currently on hold. All other clinical trials rather involve the derivation of iPSCs from patient cells either for disease modelling, drug testing or to increase our understanding of the basic biology of this cell type. An additional avenue of current research is transdifferentiation – converting one type of specialised cell directly into another. All these different research approaches are important if stem cell research is to achieve its potential for delivering therapies for many debilitating diseases. The original version of this factsheet was created by Claire Cox and reviewed by Austin Smith, with expert input from Paolo Bianco, Ian Chambers, Allen Eaves, Tariq Enver and Thomas Graf. It was researched and updated by Sabine Gogolok and further reviewed by Phil Rossall, Research Manager (Knowledge Management) Age UK and Fellow, University of Edinburgh (Knowledge Exchange). Lead image © iStock/Les Cunliffe. Other image credits: Sally Lowell, Sophie Morgani, Luke Boulter and Andrew Jarjour, MRC Centre for Regenerative Medicine, University of Edinburgh; Cameron Duguid.